Mr Trump was in Europe last week for the annual meeting of the G-20, the heads of government for the world's 20 largest economies. Part of Trump's agenda on that trip was to promote exports of US natural gas in Europe, with the apparent intention of undermining Russian dominance of natural gas markets on the continent. The groundwork for this natural gas scheme was laid in late June, when the US Senate voted 98 to 2 to impose further sanctions on Russia, with the intention of waylaying the construction of the Nord-Stream 2, a subsea natural gas pipeline planned from Russia to Germany, which international energy firms are involved in. To an extent, the Europeans went along with that scheme, extending their own energy sanctions against Russia to January 31st, 2018. Nonetheless, I found this entire stratagem bizarre and self-defeating; as you may recall, I've previously pointed out that our natural gas supplies are a lot tighter than they appear to be, and there's no way that additional supplies can be developed at the prices that are being promised for these exports. What I'm going to do today is show you the natural gas data that I'm looking at, so you can see how I've come to that conclusion. Next, we'll include excerpts of a few tables on US natural gas exports. First, like the above, is a truncated excerpt of the EIA table of US natural gas exports. No surprise here, they've been rising, and now at a much more rapid pace since Cheniere's Sabine Pass natural gas natural gas liquefaction facilities started exporting LNG in May of last year..
Next, we have a truncated excerpt of the EIA table of US natural gas imports. Looking closely at the numbers, you'll see that our natural gas imports generally fell between 2010 and 2014 when our production was rising, but that our imports of natural gas started increasing again as our production fell and our exports rose. Comparing this table to the export table above, you'll see that during the winter months, when much of the US is using natural gas for heat, our imports of natural gas exceed our exports of it. For instance, in December 2016, we exported over 250 billion cubic feet of natural gas, and imported over 280 billion cubic feet of it. On the other hand, in April, when the US consumption of gas for heating and cooling is moderate, our natural gas exports did exceed our imports by around 9 billion cubic feet. The EIA projects that we will still be a net importer of natural gas in 2017, and not become a net exporter of natural gas until 2018. Next, to put our imports in perspective we have the top of the EIA's table of US natural gas imports by country. What you see here is that almost all of our imported natural gas is now coming from Canada. Since we are still importing more natural gas than we're exporting, that means that we are, in effect, importing natural gas from Canada to export it through Texas and Louisiana. Without Canadian gas coming in to replace what we export, a shortage of natural gas would develop in the US. It should also be clear from what we've shown so far that for us to export any more natural gas to Europe, much less replace what they get from Russia, we'd have to first import more of it from Canada..
Just from looking at that graph, it appears that our natural gas supplies remain near normal, slightly above the average of the 5 year range. But next, we're going to pull out an old graph from the heating season that will call that simple visual analysis into question....this is a graph we posted on March 26th, showing heating demand for this past winter in red and heating demand for the winter before that in yellow, and the long term average heating demand as a light dashed line. 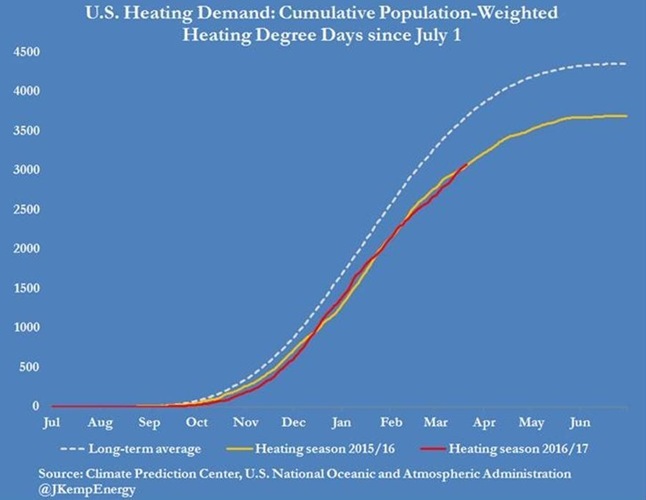 A detailed explanation of what heating degree days are and what this chart shows is included with the original post, but suffice it to say that what this chart shows is that demand for natural gas for heating was 17% below normal in each of the last two winters. With that in mind, look back at the above graph of our natural gas supplies. By following the red line, we can see that our natural gas supplies were at least at a 5 year high for the time of year from October 2015 through November 2016, with October 2016 being the first time in our history that natural gas supplies topped 4 trillion cubic feet. That's normal, we'd expect a record glut of natural gas with demand for heating 17% below normal. But notice that since December of 2016 our natural gas supplies were falling at a faster rate than normal, despite another warmer than normal winter, and by the end of January had returned to merely average. 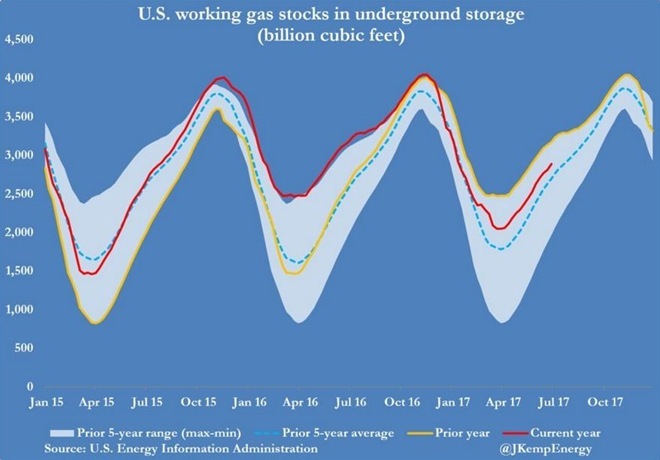 Our supplies then recovered to above average because of a record warm period that led to the first weekly injection of gas into storage in February history, but as of this date they're still nearly 300 billion cubic feet below where they were at the same time in June a year ago. What that means is that at the current pace of natural gas production, we were unable to maintain our surplus from production at a the same pace as last year, even while demand remained below normal. What that suggests is that should domestic demand for natural gas jump to above average levels, either due to increased electrical generation or due to a colder than normal winter, our production plus Canada's imports will be inadequate to meet our export contracts and our own needs at the same time. The propaganda drumbeat machine of the whatever they are political groups drowns out anything and everything off whatever message they wish to pound out.